The trend for observant women to apply for the draft is growing - and one organization helps them serve while keeping true to Torah values. Although the Chief Rabbinate has ruled against religious girls signing up for the IDF, figures show that many religious girls continue enlisting. Sharon Brick, who heads the "Serving in Faith" program of the Aluma Association which has worked to help religious women adjust to Army life for over ten years, noted that 1,616 religious women have enlisted over the past year. 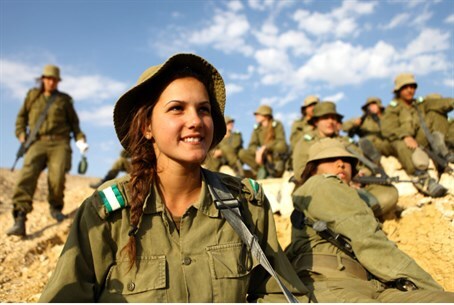 "Over the past three years, many girls who are committed to Jewish law and Torah values have joined the Army," Brick stated in an interview to Arutz Sheva Friday. She emphasized throughout the interview that the program does not persuade girls to join the Army, but merely provides information and guidance for high school students who show interest of their own initiative. "I do not want to say something against the Rabbinate, but we have a trend here that does exist," remarked Brick. "Many girls prefer to enlist as a group to local units that have a suitable atmosphere for women living a Torah lifestyle - such as being IDF teachers for religious programs in the Army," Brick continued. "Many girls prefer to wear uniforms, to be committed to serving the state and not feel like they are different [for not being included in the draft.]" Brick also stressed that Aluma does not encourage women to go into combat service, a hot topic of contention in the women's draft issue. "The main tendency is to go into educational tracks, such as soldier-teachers," she said. "But they also draft into the Air Force and Intelligence Corps as groups." "Today you can go to the Galilee and see a lot of women wearing skirts [traditional Orthodox women's dress - ed. ]," she continued. "We certainly do not encourage women to go into combat, however." Many state religious institutions do not allow Aluma representatives into the classroom, despite its sensitivity to Jewish law. However, Brick did say that principals and school boards have opened the door to them - at least, partially. "Now we find places are more open to us than have been in the past," she noted. "We don't necessarily get to speak in classrooms, but we are in touch with teachers and principals." "We have a channel for dialogue now with students who are interested in the IDF, and there are almost no girls' high schools which do not give out our information if a student takes her own initiative to ask about the Army. Even if it is not 'on the ground' in educational institutions [. . .] it's certainly with the board's approval." In January, the Chief Rabbinate repeated the ruling of the first Chief Rabbis of Israel that Jewish law forbids women from serving in the mandatory IDF draft, a ruling that led Finance Minister Yair Lapid to call for the Chief Rabbis to be fired. Religiously observant women usually have the option to choose National Service instead, but the religious community is often divided over the issue, as several IDF jobs do much of the same work, only in uniform.